Although I love solving crossword puzzles, doing so on the iPhone is an incredibly frustrating endeavor. The iPad should make a much better device for such a distraction, and several app vendors have already released or updated apps for such a purpose. Magmic has updated its NYTimes Crosswords as a hybrid iPhone/iPad app. The app itself it free, but requires a subscription ($2 for one month, $10 for six months, or $17 for one year) for access to the daily crossword puzzles from the New York Times. The updated NYTimes Crosswords app. Stand Alone’s $10 Crosswords has also been updated to run as a hybrid app. In addition to iPad compatibility, the free 2.0 update adds a new tabbed interface and improved graphics. It offers access to a bevy of puzzles from different sources. 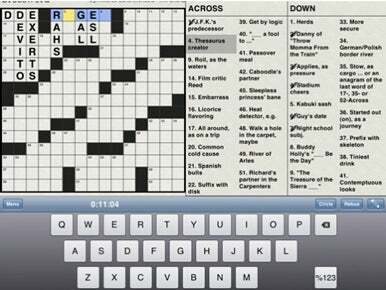 At the same time, there are also some brand new crossword apps. Wic-o has released the $3 Crosswords for iPad. It’s hard to tell at this point how many puzzles you’ll get and where those puzzles come from, although the developer promises additional free and in-app-purchased games in the future. Finally, Pathlight Software has released the $5 KrossPad, an iPad-only app that gives you access to puzzles from the Houston Chronicle, Philadelphia Inquirer, USA Today, and the New York Times (subscription required), among others.